Shah Jahan, the Great Mughal is hopping mad. Someone has replaced the precious Timur Ruby on his new throne with a … plum! What’s worse, plums are suddenly turning up everywhere. Who can help the emperor solve this mystery? A History Mystery is just that – a mystery set in history! Loaded with humour they are sure to have you gasping, for facts are often as surprising as fiction. Did you know that the throne being referred to here is the Peacock Throne? Or that it took seven years to build? The famous Kohinoor diamond hung beside the Timur ruby. It is believed that the Mughals valued these rubies even more than diamonds. Did you know that the Timur ruby, now in the Queen of England’s necklace, isn’t even a ruby? The banter between Shah Jahan’s seven children as they go about searching for the Timur Ruby makes for great reading. Is the quest for the missing Ruby successful? Well, you’ll have to read the book to find out! All we can say is that the surprising end will leave you quite satisfied on reading a tale well written. And yes, history will never be the same again. The story is dramatic, funny and intriguing. Lots of historical and architectural facts are seamlessly woven into a fun filled fictional story. 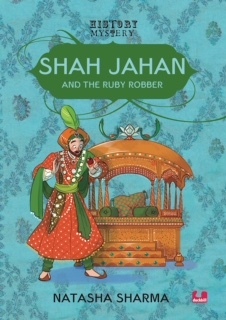 Shah Jahan’s kids are in charge of solving the mystery, which is exciting for children. When I was a kid, my favorite books were the Enid Blyton Mystery series, because kids wore disguises, and came up with plans to question and outwit grownups. This story has a similar flavor to it, though being Royal kids, it is easier for them. One thing that I can guarantee to parents, teachers and librarians is that your children will demand more. Natasha Sharma…..hurry up please, we are waiting!! Natasha Sharma writes a tight plot featuring names that the children are bound to read in their history text books. I loved her characterisation…All in all wonderful engaging read.